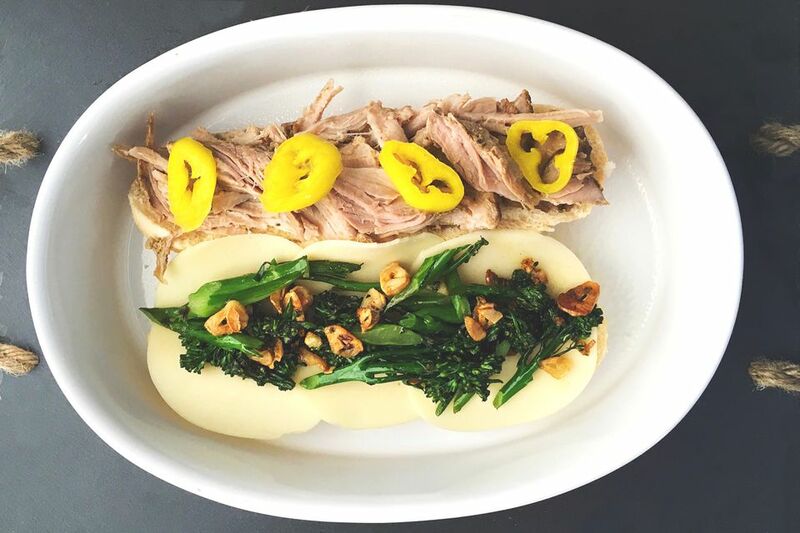 This tasty roasted pork, broccoli rabe and provolone sandwich is Inspired by the infamous hoagie from DiNic's sandwich shop in the Reading Terminal Market in Philadelphia, PA. In a small bowl, combine rosemary, salt, pepper, basil, thyme, garlic, oregano, and red pepper flakes and stir. Massage herb mixture into pork and set aside. Heat a large cast iron skillet until it's piping hot and add the oil and the pork, searing the outside until crisp and golden on each side. Once the outside has browned, take the pork and place it in a large dutch oven. Pour in beef stock, tomatoes, garlic cloves, and wine. Place the lid on it and bake until the internal temperature is 165 F. Remove from heat, set aside, and pull into chunks before serving. Add olive to a pan and turn the heat to medium. Add garlic, a pinch of salt and red pepper flakes and sauté until fragrant and softened. Add the chopped and blanched broccoli rabe and a pinch of salt and cook for a few minutes until it begins to brown. Remove from heat and set aside. Toast the hoagie roll and place three slices of provolone evenly down the middle. Add pork, banana peppers, and 3 tablespoons of the cooked garlic and broccoli rabe mixture. Wrap tightly in foil for a few minutes so that the residual heat melts the cheese and steams the bun. Unwrap and serve immediately.